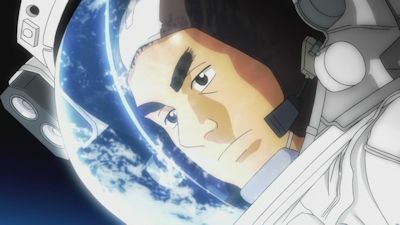 Space Brothers just keeps on trucking as it enters what is effectively its third season - but is Nanba about to throw his hopes of becoming an astronaut under a proverbial juggernaut? It certainly seems that way as he decides to ignore the advice of others and approach Azuma at the supposed after-interview party (which is, of course, the actual part of the selection provess) -a gambit which looks to have failed as his attempts to engage Azuma in conversation are deflected with ease. Azuma does, however, have a single question for this would-be astronaut - a question once asked to Azuma himself by none other than Brian Jay. "Are you prepared to die?" It's an answer to which Mutta has a surprisingly honest answer after initially choosing to bluff his way through it, and an answer which will surely strike a chord with Azuma himself given both his own experiences and his time with Hibito. There's little opportunity to mull over this and what it means for Mutta's place in the selection process however, as it's time to move to Florida to watch the shuttle launch and, first and foremost, say au revoir to Hibito and the other astronauts before their final preparations for take off. Thus continues Space Brothers' insistence on being a slow and steady series - although I was expecting some potential for major drama from Mutta and Azuma's meeting it passed by without any fireworks before shifting our focus elsewhere thanks to the imminent shuttle launch. Slow-going it might be, but its blend of strong characters and the "space exploration is awesome" vibe carried by the series always seems to manage to stop its pace from feeling overly glacial, especially as the tension begins to be subtly ramped up thanks to Hibito's situation. It probably shouldn't still be so fascinating as we reach towards the thirty episode mark, but Space Brothers is still keeping me hooked rather tidily.